Albergo La Perla v Siena, Itálie: Zarezervujte nyní! Our hotel is located at the second floor of a beautiful medieval palace (sorry but there is no lift, the building is too ancient!!!!!) 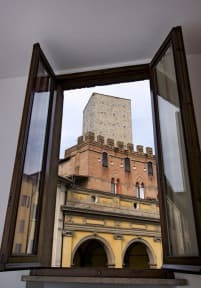 and its windows open up to the square with views of 'Pulcino Tower' and town roofs as well as a sight of ' S. Domenico church' and 'Saint Caterina Monastery'. This hotel has got 13 single, double, and triple rooms, all ensuite, television and air conditioning . The rooms are bright with panoramic views. The bedrooms are split between the second floor and in the attic with views of Siena. On July 2nd and on August 16th every year the widely celebrated 'Palio' is held in Siena. You will enjoy, please visit us and groups are especially welcome.